In The Christmas Carol Reader, William Studwell records an intriguing bit of misinformation about this carol, concerning Bishop Telesphorus of Rome in A.D. 129. According to the tale, the Bishop ordered the refrain of this carol to be sung annually to celebrate the birth of the Christ child, and that this refrain evolved into the famous French carol “Les Anges dan nos Campagnes.” Charming, according to Professor Studwell, but incorrect. In fact, the carol appears to have come from France in the 18th century, possibly from the Lorraine region. Several sources indicate that first French publication was in Quebec in Choix de cantiques sur des airs nouveaux (1842). Another early French collection was Nouveau recueil de cantiques (1855). The first certified English translation was in by the English Bishop James Chadwick in his 1860 Holy Family Hymns. Another early English publication was Henri Frederick Hemy's Crown of Jesus Music, Part II, 1862. 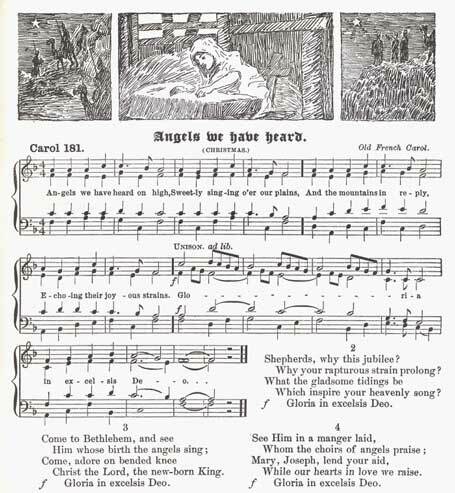 R. R. Chope followed in 1877 with Carols for Use in Church, with a sanitized fourth verse for the Anglicans, which, as Keyte and Parrott noted, avoided calling on Mary and Joseph. Here's where it gets a bit hazy. Some sources believe that the first English translation was by James Montgomery on December 24, 1816, in the Sheffield Iris in a poem titled "Nativity"; it would later be known as the carol “Angels From The Realms of Glory.” The scholars seem to be lined up both for and against on this issue. Both sides seem to have their arguments. My college French is now 40+ years old (and, honestly, was never that good anyway), but the literal translation provided by Keyte and Parrott in The New Oxford Book of Carols doesn't seem to support this contention. For me, the fact that the first French publication, in Quebec, 26 years after Montgomery's poem appears, doesn't support the "for" argument. "Your mileage may differ." 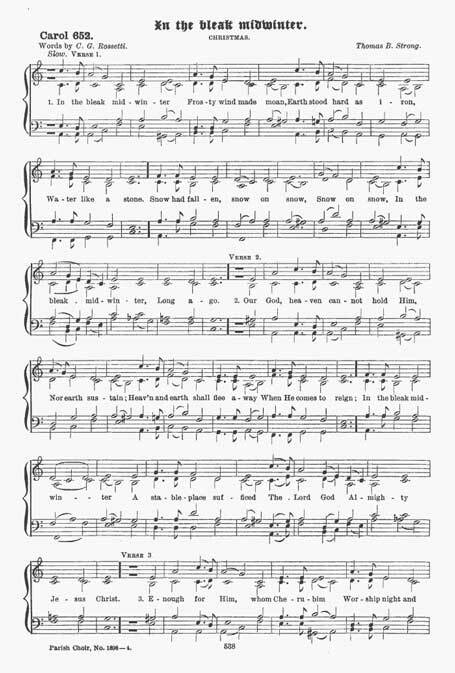 Many modern versions use a version of "Gloria" an anonymous tune arranged by Edward Shippen Barnes (1887-1958), an American organist who studied at Yale University from 1910-11 and then briefly at the Schola Cantorum in Paris. On his return to the United States he was the organist at the Church of the Incarnation in New York from 1911-1912, at Rutgers Presbyterian Church from 1912-1924, in Philadelphia at Saint Stephen's Church from 1924-1938, and in Santa Monica, CA at the First Presbyterian Church from 1938. He died at Idylwild, Ca in 1958. In addition to his arrangement of "Gloria" (at an date unknown to me), he composed numerous other musical pieces. 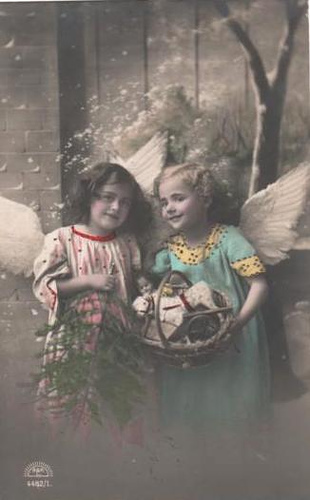 (Version 1) Words: Traditional French carol, "Les Anges dans nos Campagnes" Translated from French to English by Bishop James Chadwick (1813-1882); Appeared in Holy Family Hymns (1860) and The Crown of Jesus Music (1864, adapted by Henri Friedrich HÄmy). Music: "Gloria (Barnes)," an adaptation of the French carol melody “Les anges dans nos campagnes,” arranged by Edward Shippen Barnes (1887-1958). And the mountains in reply? 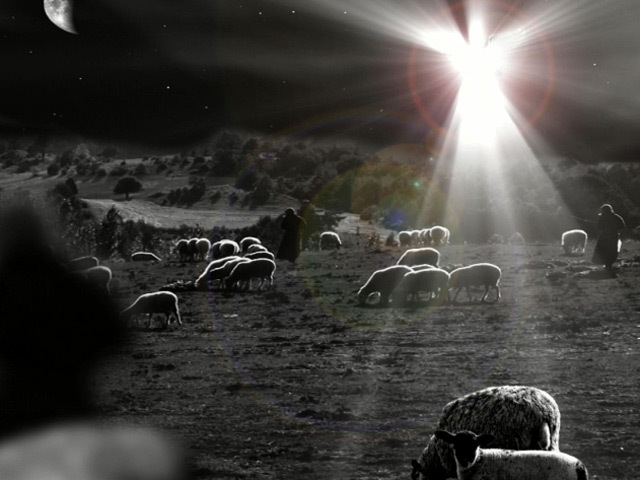 To proclaim the Savior's birth! Music: "Gloria (Barnes)," an adaptation of the French carol melody “Les Anges dans nos Campagnes,” arranged by Edward Shippen Barnes. 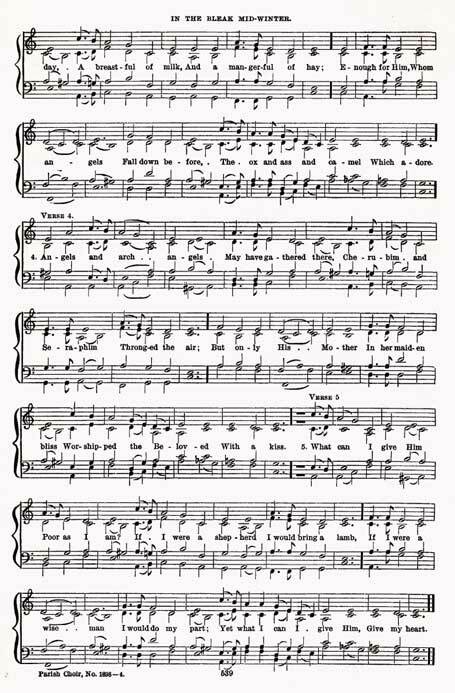 “Bright Angel Hosts Are Heard On High” (A "Cornish Carol," from Richard R. Chope, Carols for Use In Church, 1894; also printed by Rev. Charles L. Hutchins, Carols Old And Carols New, 1916.) Both tunes bear a strong resemblance to "Gloria," an arrangement later created by Edward Shippen Barnes. 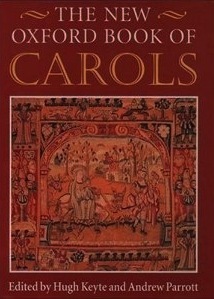 The editors of The New Oxford Book of Carols have a good background on this carol and Les Anges (#195). Deo," Latin for "glory to God in the highest." sung at midnight mass each Christmas Eve. Campagnes" and the music from a popular French song of the day. 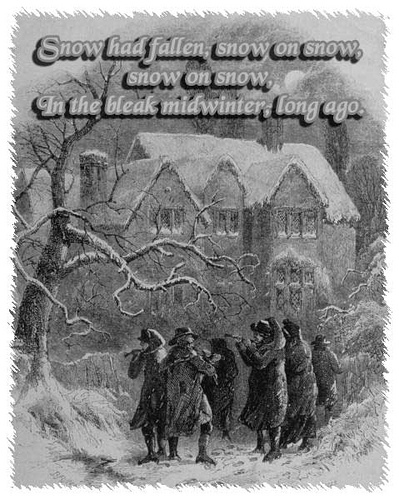 "In the Bleak Midwinter" was written by English poet Christina Rossetti (1830-1894) for inclusion in her 1904 collection, Poetical Works, where it was indicated to have been written before 1872. This text then gained great popularity when it was paired with "Cranham" in The English Hymnal, 1906. Written by the famous composer Gustav Holst (1874-1934), "Cranham" was composed specifically for this text. Although Christmas was linked by the 4th century church with December 25 as part of a strategy to Christianize various mid-winter solstice pagan festivals, there is no biblical association of the birth of Jesus with mid-winter. This poem appeared, dated 1872, in the posthumous collection of Christina Rossetti, a deeply religious daughter of an Italian emigré academic and English mother (so religious she refused the proposal of marriage from a man she loved deeply and thereafter became prone to melancholy). Harold Darke's well-regarded setting was written in 1911 and published by Stainer & Bell, London. It was originally made famous by the Choir of King's College, Cambridge. Darke was born 29 October 1888 in London and died 28 November 1976, in Cambridge. Darke received his formal training at the Royal College of Music, where he studied composition with Charles Villiers Stanford, and at Oxford. He had a worldwide reputation as one of the finest organists and choristers of his era.